I thought I had read Thomas Wolfe, but it turns out I haven’t. 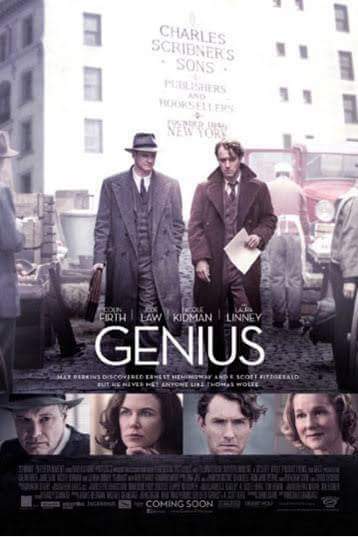 That didn’t stop me from going to see the movie Genius, which details the publication of Wolfe’s first two novels, and his relationship with his editor Max Perkins. Jude Law’s Wolfe is a loud, melodramatic Southerner, self-involved yet low in self-esteem. Colin Firth as Perkins is his solid, steady opposite, the voice of reason who, despite his better judgment, is drawn to Wolfe’s charm and bravado. I expected the movie to focus on their editorial process, and it does. But instead of passing any judgments on Wolfe as a writer, it celebrates their relationship – – more like a father and son than editor and writer. Both of their families suffered at times from their single-mindedness, but no one more than Wolfe himself. I now have Wolfe’s first book Look Homeward, Angel on hold at the library. I suppose I was charmed as well.